Tax law changes raise the price for college football and basketball fans. Schools also may be subject to excise taxes for coaching salaries. 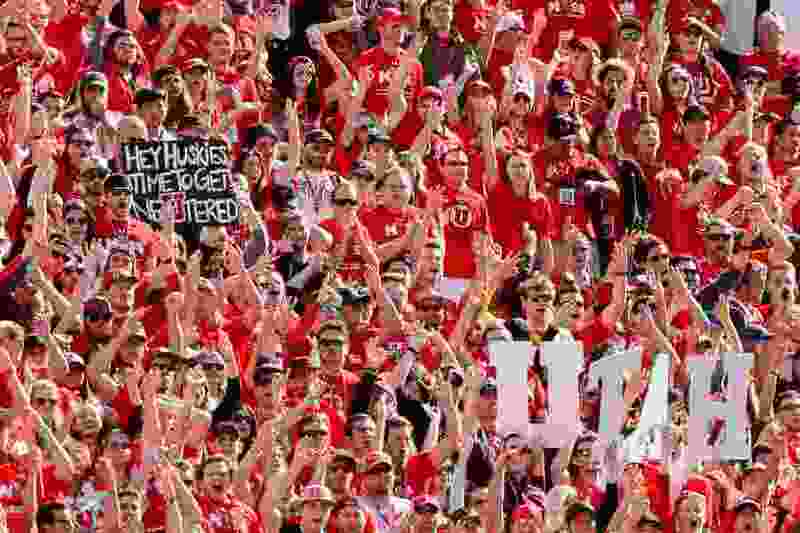 Trent Nelson | The Salt Lake Tribune Utah fans as the University of Utah faces Washington, college football at Rice-Eccles Stadium in Salt Lake City, Saturday October 29, 2016. The value of season tickets to college football and basketball games is only part of the expense for many fans. Those tickets will cost more in 2018 aside from any price increases. A provision of the new Tax Cuts and Jobs Act that took effect in January eliminated the 80-percent deduction for donations to university athletic departments that are tied to ticket purchases. About half of the University of Utah’s football and basketball season tickets require such gifts, with a higher percentage in football. Fans were asked in 2017 to donate from $250 to $515 to the Crimson Club for the opportunity to buy seats between the 20-yard lines at Rice-Eccles Stadium. In the past, $400 of a $500 donation tied to seating could be deducted. Ticket-renewal campaigns under way this month will help schools gauge how much of a deterrent the law may become. Major athletic programs also are faced with paying 21 percent excise taxes for every dollar over $1 million paid to their highest-salaried employees, in most cases football and men’s basketball coaches, under the new law. In Utah’s case, the income of football’s Kyle Whittingham ($3.7 million) and basketball’s Larry Krystkowiak ($3.4 million), would make a total of $5.1 million subject to the excise tax, costing the school slightly more than $1 million. Fandemonium is an occasional series about the sports fan experience in Utah. This installment: How the new federal tax laws may affect fans whose season-ticket purchases require donations to college athletic departments. There is some suggestion within the industry, though, that a loophole may keep public universities exempt from the excise tax. That’s being studied. BYU’s coaching salaries are undisclosed. Based on comparisons to other athletic departments, the private school likely would have to pay the tax on the contracts of football’s Kalani Sitake and men’s basketball’s Dave Rose. Utah State’s coaching pay is below the $1 million level, so the excise tax would not affect USU athletics, even if it is enforced for public schools. In response to the pending law, about one-fourth of USU’s donors made their 2018 payments in December, Hartwell said, qualifying for the deduction. Utes boosters, who contribute nearly $9 million annually, paid about $500,000 in December, Smith said. Utes fan Peter Harrison said he now will make his donation through his limited liability corporation. Most fans informally surveyed said the loss of the deduction will not immediately affect their ticket purchases but could have an impact in the coming years. The premium seats in BYU’s LaVell Edwards Stadium and the Marriott Center are tied to a priority points system on levels of giving through the Cougar Club rather than specific donation figures. BYU, like other schools, is observing how the new law will affect support, but “we believe our fan base is incredibly loyal,” associate athletic director Duff Tittle said.